Step 9 is not repeated in this Moon series. This is a variation of The Cobra, which is one of the most powerful Yoga postures. Detailed instructions are given in the Postures series for this posture. As you move into this position from Step 8, exhale (not slowly) as you move down with your hands and tummy on the floor. Use your hands for support and stretch both knees out behind you and balance yourself with your toes firmly planted on the floor and your hands down on the floor for support as you stretch your spine up with your head straight. Repeat: use your toes for support and lift your spine with your palms supporting you. Do not lift below your abdomen. Use the palms of your hands for support more than your arms to really get the full stretch in your spine. If you have back problems, lift with your spine only as far as you can, comfortably (don't use your arms to lift). 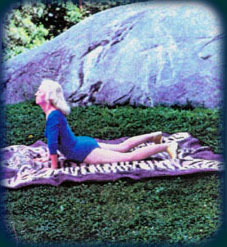 Again, this position reminds us of The Cobra asana (link provided for details above) in Hatha Yoga. However, you would use only your spine for support, not your arms and hands (since The Cobra is not a weight-lifting exercise, but a spine stretcher!). Inhale as you feel your spine stretching up. Also, unlike The Cobra, do not stretch your neck and look up and back. Keep your chin straight, as Eugenia shows in the image above. Inhale as you come down into the next pose. This is the same as Step 6 with a slight variation. Hold your breath for a moment and then breathe normally with your abdomen if there is any strain. 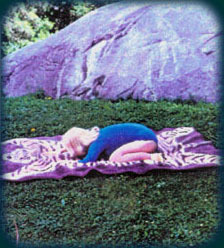 Bend both knees and move your body down to the ground in what looks like The Child's Pose. Eugenia makes a fist with both hands and places one on top of the other. Then she can rest her forehead on one and keep her face and neck straight. This is also fine to do instead, if it is easier for you. If you cannot come forward like this, just sit down on your knees and try to move forward and relax with your chin in your chest and arms behind your waist. This time, you will try to place the inside of your feet perpendicular and flat on the ground (as shown above). If this is too difficult, just keep them in a comfortable position for you. Bring your head down, but keep your forehead and chin up off the floor as Eugenia is doing here. Place your elbows on the ground and your hands in front of your face. Look at your fingers in this position. Inhale and hold your breath for a moment and then exhale as you move into Step #11, which is only done once in the Moon series.